expensive accumulating items to use as decorations. on storing space for so many seasons and holidays. 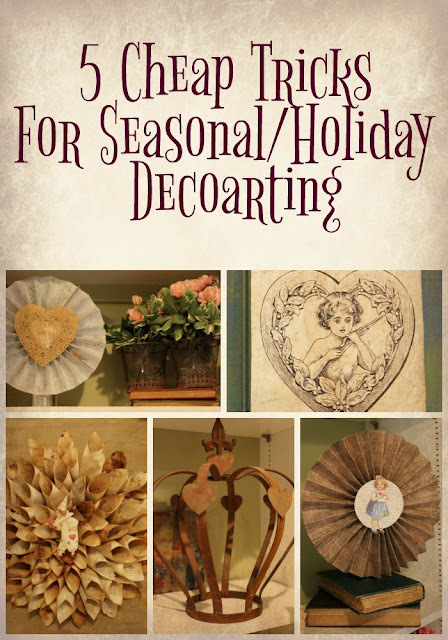 can be adapted for different seasons and holidays. item(s) make them seem like they are just for that holiday. foam hearts to them to carry out my "Queen of Hearts"
and on clearance from Michaels last year. make just for Valentine's Day. item but is easy to pull off when the holiday is over. book section of most crafts stores. to make decorative items for your displays/vignettes. but probably cost less than $5 a piece in materials. like to see how to make them...Vintage Valentine Mantel. add visual interest and a neutral color to the display. made large or small. Just choose paper to fit the occasion. Here's how to make them if you have not done it before. decorations too. So fun and cheap...here's how. your decorating is to Google "Free Clip Art For_______". quickly see what I like and don't like. out on decorative paper to put in your seasonal display. printed out on cardstock aged with coffee grounds. worked out to make them stand upright in your display. Put a rolled piece of tape on a straight-sided bottle or jar. Push the printed-out clip art against the tape. tape the clip art to the top of the skewer. the center image that you choose to add to it. center image with the seasons. Here is how to make lollies/paper rosettes. inexpensive flowers that you can. Cut off the greenery. needed. This can add color and life to your displays. living room but against a different wall. hearts in this display "The Key To My Heart". painted with DIY chalk paint. Want to see the recipe? accessories to fit in with your home in this blog post. hearts glued onto to piece of twine to "hold". This angel "as is" from a garage sale. versatile to hold different seasonal objects. faux aged paper for glass cabinet display. changed out with shamrocks, shells, Fall leaves, etc. 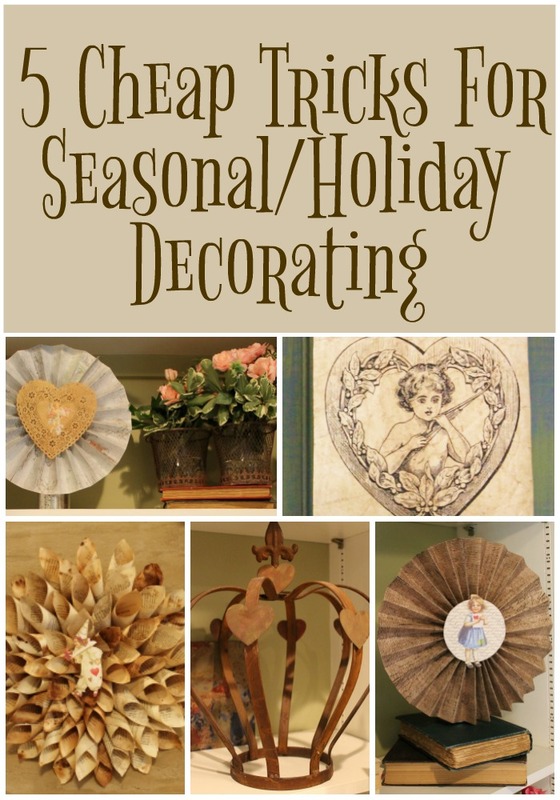 for different seasons or holidays. decorating ideas on the navigational bar under my header. Amazing creativity! The eye you have for recycling, re-purposing items is so incredible! Keep them coming sis! I like the free clip art too. Your bookshelves look really nice with the paper crafts. Thanks for sharing at Home Sweet Home! Darling ideas! Your home looks great. Enjoy your week.